Veal marsala is like spaghetti and meatballs - “Italian-American” fare, not really Italian, but sort of Italian. Due to the massive influx of Italians that immigrated in America, Italian-American cooking takes cues from both cultures. I’ve never seen veal Marsala in Italy, but it’s popular in America, and is even easier to make than spaghetti and meatballs. And only requires one pan. Even better, in this age of everyone wanting a dish that are fast, easy, and not too rich, veal Marsala checks all those boxes. Even better - if you are not a big fan of veal, it can be made with chicken. You season the cutlets before frying them up in a big skillet. The finished dish has mushrooms, a bit of stock, and a good pour of Marsala. The final flourish is a sprinkling of chopped herbs. Our friend Diana, owner of Italy's greatest B and B, posted this recipe on her blog back in January. I made a note of it and when I saw veal on sale last week I bought some to give this stew a try. Besides being one of the most gracious hosts I have ever met, Diana is also an incredible cook. I knew that this would be a stew to remember. It cooks slowly, leaving the veal meltingly tender. I've had veal stews that were white (generally made with white wine, cream, and stock) but this recipe is more typical of southern Europe. In fact, was quite similar to a traditional Montenegrin recipe for a classic stew of cheap veal cuts cooked in a beef stock sauce with tomatoes, carrots, bacon onions and herbs. Regardless of the recipe's origins, it made a delicious stew with which to celebrate the end of another winter week and the start of a long weekend. Place the flour in a large zip lock bag. Season with salt and pepper. Place the veal in the bag, seal, and shake it to coat the veal with the flour, salt, and pepper mixture. Heat 3 tablespoons of olive oil in a large stew pot. Brown the meat in the olive oil. Remove and set aside. Add more oil to the pot if necessary. Brown about 100 g. of pancetta. 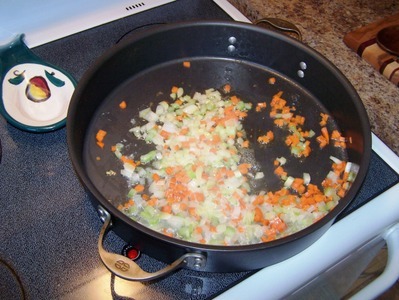 Place the onions, celery, carrots, and garlic in the pot. Let them sautee until the onions are transparent. Pour the half a bottle of a decent red wine (I used a Barbera from Diana's beloved Piemonte) over the sauteed vegetables. After the alcohol evaporates, add a 14 oz. can of crushed tomatoes and the whole cloves. Put the meat back in the pot. Salt and pepper to taste. Let it all simmer together for two hours. If the sauce gets too thick, add a little red wine to thin it down. Serve the stew over polenta with some great wine and warm, crusty bread. Diana adds the following tips: If, at the end, the flavor is too acidic and the sauce is too thin, you can mix a bit of melted butter with flour, and add to that a teaspoon of honey. Add this to the sauce and let it cook together. a gratuitous self-promotion . . .
One of our photos from Italy has been entered in a photo contest. Our photo is currently number 12 out of 467 photos. Remember a 10 is good! Feel free to e-mail the link to friends and loved ones! Last week (I think it was last week, my lord how the time flies when you are being a complete slug) I was flipping through the December edition of Food and Wine magazine looking for something warm and hearty to make. This recipe seemed to fit the bill. 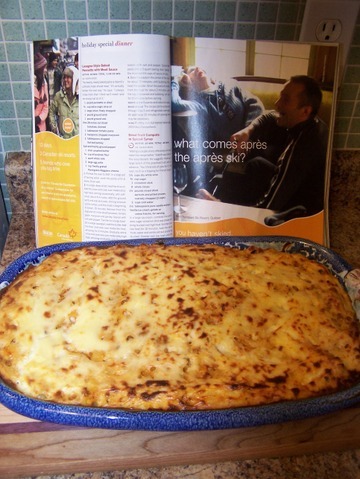 The article that accompanied the recipe assured us that it was even better the second day - and it was! Preheat the oven to 350°. In a large pot of boiling water, cook the pasta until al dente. Drain well. In a large, deep skillet, heat the olive oil. Add the onion and cook over moderately high heat, stirring occasionally, until softened, about 4 minutes. Add the ground lamb and veal and cook, stirring to break up the lumps, until the meat is beginning to brown, 10 minutes. Remove from the heat and stir in the diced tomatoes, tomato paste, marjoram and parsley. Season with salt and pepper. Transfer to a large bowl. In a large saucepan, melt the butter. Add the flour and cook over moderate heat, whisking, for 2 minutes. Gradually whisk in the milk and cook over moderately high heat, whisking constantly, until the sauce is very thick and boiling, 7 to 8 minutes. Remove from the heat and whisk in the egg yolks and the Parmigiano-Reggiano. Stir all but 1 1/2 cups of the sauce into the meat mixture along with the pasta and season with salt and pepper. Spoon the pasta into a 3-quart baking dish. Spread the reserved 1 1/2 cups of sauce on top. Tonight we made Osso Buco following a recipe posted by Jane (a pal from the slow travel) message board. I've always wanted to try it but for one reason or another have not. WOW I can't believe what I have been missing. We served it on a bed of risotto Milanese with a side of rapini with garlic and pecorino. Remember that this is a stew and it is absolutely imperative to cook this until it is almost falling off the bone. It needs to be super, super tender. This is often the problem in restaurants—not cooked long enough. 2. Use a heavy broad casserole, 8 – 10 quart, large enough to hold all the veal pieces flat-side down in one layer (or use 2 casseroles, but do not stack shank pieces on top of one another). Heat the butter over moderate heat. When it begins to foam, add the pancetta, onion, carrot, and celery and sauté for about 5 minutes, until carrot and celery begin to soften. 3. 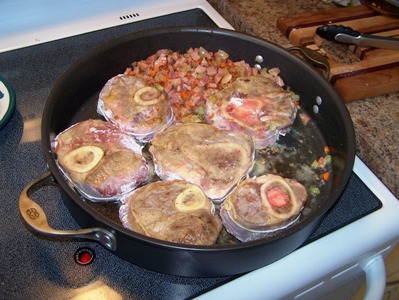 Dredge each piece of veal shank with flour, brushing off the excess. 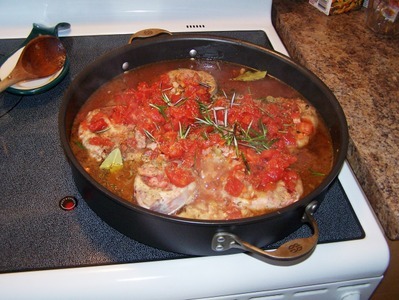 Heat the oil until it is very hot in a large skillet over moderate-high heat and place the floured shanks in the pan. Turn the shanks until they are browned on all sides, then place them flat-side down in the casserole with the pancetta and vegetables. 4. Skim all but about 1 tbls. fat from the skillet. Pour in the wine and boil for 2 -3 minutes while scraping the sides and bottom of the pan with a wooden spoon. Pour the wine and the deglazing over the shanks in the casserole. 5. Add the tomatoes, thyme, bay leaf and parsley to the casserole with enough meat both so that the liquid just covers the shanks. Add salt and pepper to taste. Turn the heat to moderate. 6. When the broth begins to simmer, cover the casserole and place it in the preheated oven. Cook for 2 – 3 hours. Every ½ hour baste the shanks to keep them moist. 6. Just before serving, make the gremolada: Combine the garlic, lemon rind, parsley and anchovy. 7. To serve, remove shanks from the casserole and place on individual plates. Cut the strings. Spoon some of the sauce over each piece and top each serving with a sprinkling of gremolada. Notes: Each shank piece should be tied with string to prevent the meat from falling away from the bone and into the broth. When the veal shanks have finished cooking, the sauce around them should be rich and thick. If it is thin and watery, remove the pieces of veal and place the uncovered casserole over moderate-high heat on the stove. Cook until the sauce has thickened, stirring frequently so that it doesn’t stick or burn on the bottom. 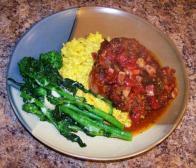 Osso Buco can be eaten as soon as it is taken from the oven. However, like other stews, it improves with a day’s wait. Here is dinner - all I can say is YUM! Val d'Aosta is a mountainous area that borders the Piedmont area of northern Italy. Cut a horizontal pocket in each veal chop. Insert 1 prosciutto piece, 1 piece cheese, and 3 sage leaves in the pocket (I placed the cheese and sage on the prosciutto and rolled the prosciutto up 'jelly roll' style prior to inserting it int he pocket). Push the edges of the chop together to 'seal' around the pocket. Preheat the broiler (or grill). Brush the chops with olive oil and sprinkle with salt and pepper. Broil or grill, turning once, about 4 minutes per side for rare, or done to your liking. Meanwhile, heat the tomato sauce. 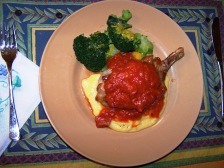 I served the chops over a 'puddle' of creamy polenta and spooned the hot tomato sauce over top.